McDonald's Tweet Blasts President Trump, And Is Quickly Deleted : The Two-Way McDonald's says its account was "hacked by an external source." The tweet drew a wide range of responses — from pledges to eat a Big Mac today to calls for a boycott. 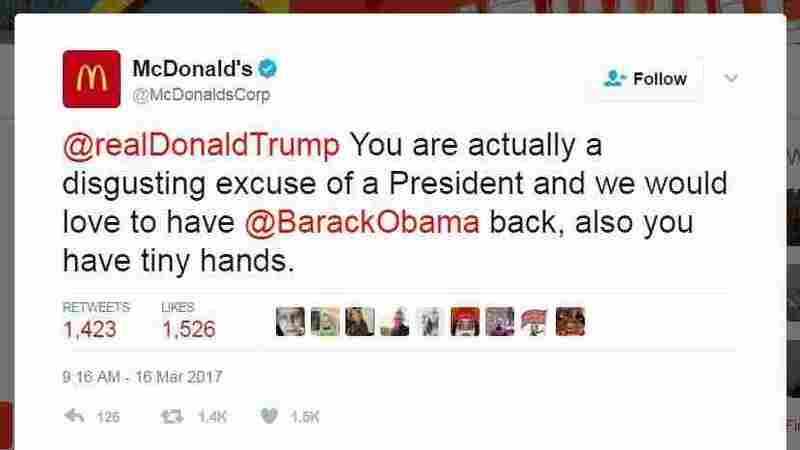 A tweet from McDonald's corporate account attacked President Trump on Thursday; it was deleted within 30 minutes. A post on McDonald's corporate Twitter account caused a stir Thursday morning, denigrating President Trump and calling for Barack Obama's return. The tweet was up for about 20 minutes only — but in that time, it was liked and retweeted more than 1,000 times. "You are actually a disgusting excuse of a President and we would love to have @BarackObama back," said the tweet, which was briefly pinned to the top of the McDonald's page. It concluded, "also you have tiny hands." McDonald's apologized, saying its account had been "hacked by an external source." Posted at 9:16 a.m. ET, the tweet quickly drew a wide range of responses — and guesses over whether it was the work of an external hacker or a disgruntled employee. The tweet came as a significant departure on a corporate account that normally contents itself with marking holidays, promoting McDonald's outlets and informing investors about company strategy. "I assume somebody decided to quit their social media job in style," reads one popular comment. Others joked that perhaps the Hamburglar, the McDonald's cartoon character, had infiltrated the company's social media division. And some, assuming that the tweet would be short-lived, posted a Web Archives link to the message. While people posting those early responses didn't seem to believe the message reflected a shift in McDonald's public stance on America's leadership, several of them did say that they're now planning to eat a Big Mac today. Other reactions came from Trump supporters — within an hour, one Twitter user had asked McDonald's: "Why would you post this! You think it's ok to insult our president? For the record Obama was a failure!" That tweet included a new hashtag, #BoycottMcDonalds. The now-deleted tweet comes one year after Trump explained his appreciation for McDonald's and other fast-food chains, saying on CNN that the restaurants were run to tight standards. And, he added, he likes the Filet-O-Fish as well as the burgers. After clinching the Republican presidential nomination last May, Trump posted a photo of himself eating a meal from McDonald's on his private jet, in an image that inspired a number of digital retouches.